THE LEAVES BY HUNDREDS CAME Cross Stitch Sampler Kit is now available for pre-order. Please CLICK HERE to order. So, it's really fall. It's still kind of sinking in. Amelia's first week of school went blissfully, thrillingly by in a flurry of new shoes and new routines, long drives and books on tape (thank you for the recommendations). It's been nothing short of extraordinary, for all of us. She seems to have, literally, matured before our very eyes, all in the span of a week. I wouldn't have believed it if I hadn't seen it myself. I went from having zero time to myself during daylight hours to having six entire child-free hours a day, and I'm still getting used to that, and now am missing her profoundly. In a good way, but still. These milestones. I mean, everyone says this will happen and then it does. I remember this so well four years ago when she first started going to a lady-in-the-neighborhood's house for two mornings a week with three other little kids. Leading up to it I was really excited to just have a few hours of time to myself, and then a couple of days before it was time for "school" to start I totally lost my nerve and got profoundly nostalgic/sad/happy-in-a-sad-way/generally emotional about everything and nothing at all. It was like my body, unleashed from its constant, real-time diligence, sort of blobbed out and puddled in the road. I feel like that today, heightened, perhaps, by the morning's golden light, and cool breeze, and suddenly red leaves. I don't know. Her tap shoes came in the mail yesterday when we got home from school and she hastily pulled them on, and had me tie the bows. Immediately afterward her grandma drove up, bringing with her two big pieces of big bubble wrap, and Amelia's glee as she tap-popped every cell in her new black-patent shoes and her turquoise tights almost brought me to tears. Fall. I get choked up. She loves everything so much. And I love her. This kit will be shipping sometime around the middle of October. We have the fabric and floss on hand right now and I just have to send the pattern off to the printer this week. We will assemble and ship as soon as possible, if we can manage it sooner than mid-October, and I'll keep you posted on our progress here. As I mentioned when I first launched lotion bars this summer, when I started dyeing yarn earlier this spring my hands started to get really dry from all of the washing and rinsing of yarn I needed to do. I got interested in making lotion bars with my own customized essential oil blends. Lotion bars are great because they have no water in them, so they last for ages and a little goes a long way. I've been really pleased with how they well they work and they smell absolutely amazing! Autumn Woods is made with beeswax from local bees; coconut oil; unrefined shea butter; lanolin; and essential oils of cedarwood, fir, balsam Peru, and a drop of cinnamon. It's such a nice, light, earthy, spicy smell. I totally love it. By the way, thank you to all of you who provided feedback on the first round of lotion bars. Everyone was so nice and happy with them that it made me feel so great. I'm so glad you like these, and, in addition to this new one, I'll also have a new one coming for winter, as well (probably sometime in November). These don't sell out; as I develop new scents and source new molds all of them will be available indefinitely in my shop, so keep them in mind as stocking stuffers as we get closer to Christmas, because they make perfect little gifts. We'll make as many as we can sell. All bars come in a reusable tin, as pictured. Please note: Lotion bars are solid at room temperature but can start to soften in very hot weather while in transit. Your bar will be packed in its tin with absorbent paper, but shipping it at this time of year may result in the design appearing a bit soft by the time it reaches you. This won't affect its qualities. Many people did say that they received their summer lotion bars in very hot weather and they looked absolutely none the worse for wear, so I feel pretty confident that yours will look great. But I did want to mention it just in case. We do ship overseas! To place your order, you will be required to read this information, which contains details about international shipping and customs fees you may incur when ordering outside the U.S. (If you are overseas, the shipping cost charged by Posie does not include any further charges you may incur when importing goods.) To see the shipping-only costs for your order and location, just place the items in your cart and choose your location (or enter your zip code, if you are in the U.S.) and it will tell you how much the shipping is. As usual, I have a sincere request: Please check on and update your shipping address correctly in your Paypal preferences so that there is no confusion when we go to ship. If you do need to add things to your order or change your address after you've placed the order, just email me. I will cancel your order and you can place a new one with all of the things you need, etc. I used to try to combine orders manually for people and it has just gotten too complicated for me, so I'm going to go back to my original policy of just one order per person if you want everything you order to ship all at the same time. If you place two orders, I will assume that you want me to ship them separately unless I hear otherwise. Please note that all supplies, and anything else you order at the same time, will be shipped along with your Leaves by Hundreds Came kit and lotion bar. If you need other items before the kits or lotion bars go out, please place a separate order that will ship right away. Whew. THANK YOU everyone. I am very excited to get into my new routine and have more time to work. I have so many ideas coming up and I'm really looking forward to sharing them with you. Hello, dear friends! I'm knocking things off my list today. I've wound yarn, made stitch markers, taken pictures, and gotten all of the second-batch Time of Flowers kit orders out. Whee! The PDF-only option for Time of Flowers is also now available and you can purchase it here. This pattern is a digital download, and will be made available via a link on the screen immediately upon completion of payment. A link will also be sent (automatically and immediately) to the email address you use to order the pattern. Please save all downloads like this directly to your hard-drive in case you need to reprint in the future. As always, if you have any trouble, please let me know! I'm sorry it has taken me so long to write this little informational post for you. I've been meaning to do it for ages. I get a fair amount of questions about substituting fabrics for my cross stitch patterns, and I'm going to try to break down a few of the options, and make things like stitch counts and fabric counts more clear than they perhaps might be to you right now. I'm going to take a lot of the information in this post from a tutorial that I wrote several years ago that you can always find on aliciapaulson.com; if you haven't read that and you're still finding yourself confused by this, give that a look and then let me know how I can help clarify further. Counted cross stitch is not worked onto fabric that has been pre-printed. Counted cross stitch uses special fabrics that are called evenweave fabrics. These fabrics are woven so that they have the same number of warp threads (or, the threads running lengthwise through the fabric) and the same number of weft threads (or, the threads running crosswise, from selvedge to selvedge). In counted cross stitch (and from here on out, I'll just call it cross stitch) you work each stitch over the grid of perfect squares made by the warp and weft threads of your fabric. Cross stitch can be done on different kinds of evenweave fabric, including evenweave linen, some woven ginghams, Aida cloth (which has a very ponounced grid that helps you see the holes into which your stitches go), waste canvas (which is a removable grid you temporarily apply to a piece of non-evenweave fabric that helps you place your stitches), and various other types of fabrics made especially for cross stitching. The fiber content and type of weave of the fabric you choose to use is largely a matter of personal preference. I use linen fabric for my kits (and the samples I've made up for my patterns), but a lot of people ask me if they can substitute Aida cloth. And the answer is: Yes! You can! I'll explain further. What really matters is the "count" of the fabric. Thread count refers to the number of warp and weft threads per inch in the woven fabric. 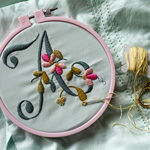 Stitch count refers to the number of cross stitches per inch you will have in your finished design. Aida cloth, for instance, is labeled according to stitch count; 10-count Aida cloth gives you 10 stitches per inch. Evenweave linen, however, is labeled according to thread count; 28-[thread]-count evenweave linen will give you a stitch count of 14, since cross stitch on this kind of linen is worked over 2 warp threads horizontally, and 2 weft threads vertically. Look very closely at the photo above and you can see the crossed stitches going over 2 threads in each direction. To work designs in cross stitch you follow a chart. Each colored box (generally with a symbol in it) on the chart represents one set of crossed stitches. Each set of crossed stitches is relative to the other stitches in the design, so you're only ever "counting" a few stitches away from the last stitch you just made. Each color on the chart represents a specific color of six-strand embroidery floss. A color key helps you define each color of floss. This one, as indicated, is stitched on 8-count Aida fabric. Aida fabric is a good choice if you are a beginner to counted cross-stitch, or if you've struggled with evenweave fabrics in the past. If you look closely, you can see that the stitches are made directly into four little holes in each of the corners of a "square" space. Each square space equals one square on your chart. The holes are very pronounced and much easier to see than they are on linen. See how those last two, even though they are on different kinds of fabric, are the same size? That's because they both have the same stitch count at 14 stitches per inch. A bit smaller than the 14-counts. A word about embroidery floss: All of the designs that I write patterns for that are worked on 28- or 32-count fabrics use 2 plies of floss per stitch. To separate plies, you simply take your length of floss by the middle and gently work the 2 plies away from the original 6. Some people even separate the 2 plies away from each other to sort of plump up the thread, but I don't. I don't like the way it looks. That's just personal preference, so do whatever works for you. This means that, when finished, the width of the stitched area will be 6 inches, the height of the stitched area will be 8.5 inches on 32-count fabric. If you decide to use a different count fabric, you will need to recalculate the finished size of the design area. To do that, work backwards. Take the number of stitches the design is wide (101) and divide it by the stitch count of your fabric — let's just say you're going to use 8-count Aida. Seeeeee how much bigger that difference translates to, in terms of the overall design? You're going from a 6" x 8.5" design that will fit into an 8" x 10" frame to an almost 13" x 17" design, not including ANY margins around the design area. That's a pretty big difference, so you just need to pay attention to that count. You can do any design on any fabric you'd like, but do make sure that you know how big the finished design area will be. When you're purchasing fabric, you always want to make sure that you've got about 3" of extra fabric around each side of the design area. This allows you to easily mount your fabric in the hoop while you're working and also gives you enough space around your design area to stretch the fabric when you frame. There are lots of places to purchase cross stitch supplies on-line. I know that Aida actually makes a 16-count fabric in Sea Lily (the color of linen I used for Time of Flowers) that can be purchased here. 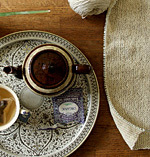 If you're local, I highly recommend you go out to Acorns and Threads sometime and visit Jeannine and the ladies there. This is such a gorgeous store with some of the best customer service you will receive anywhere, for anything. This store is a true local treasure, and it will inspire you more than I can say. Did I miss anything? Please feel free to ask about anything that's unclear! Let me know!